When experimenting with found photographs and polymer plates I had to reject the first plate. During a break I took a closer look at the rejected plate, cut it into smaller random pieces and when printing these tiny plates the children happened to appear with a strong visual impact on the thick creamy paper, I knew these portraits had to be turned into a book. 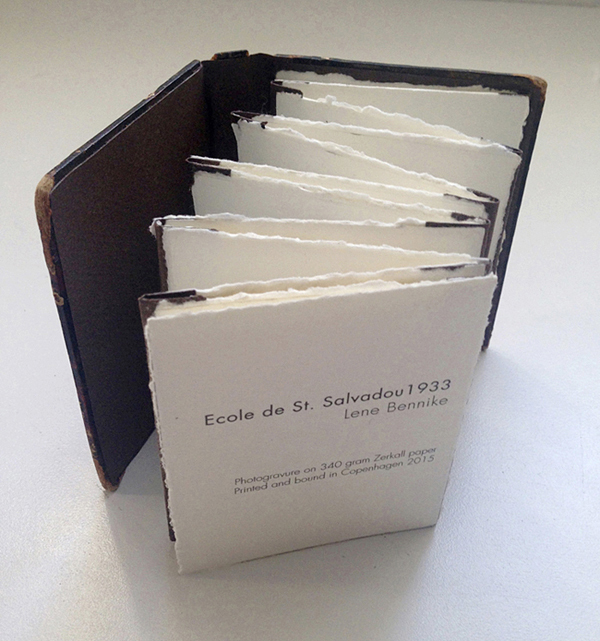 WIth focus on childhood and school life by adding handwritten testimonies from old French school books from the same period. A book with an overall focus on recycling. 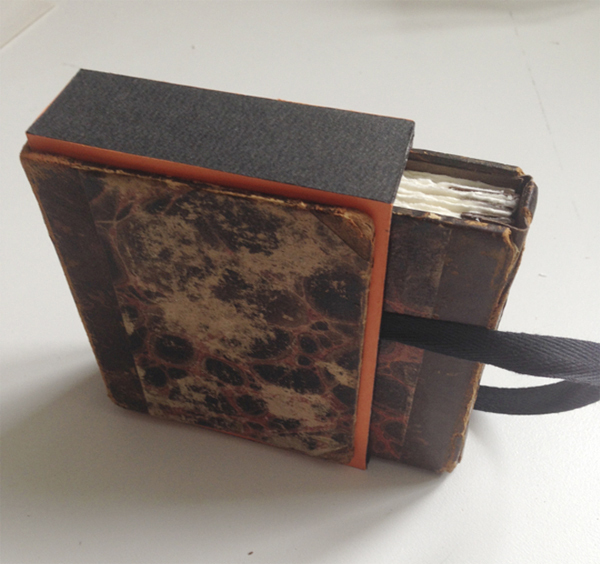 The cover is a rather worn leather bound book from 1826 in red and brownish colors. For the inside of the cover I used a found piece of brown Canson paper part of which has also been used to glue the prints together thus forming a leporello with images on both sides. A good example of recycling. The book is printed and bound in Copenhagen 2015. Printed on Zerkall Wove paper 340 grams, leporello format, book size 9 x 10.5 cm, paper size 7.5 x 9.5 cm, total length when lying flat: 206 cm. 18 photogravure prints + colophon in black and white. Some of the photogravures are printed chine collé with paper from old school books written in sepia or blue ink even some with the teachers annotations in red. A little casette from an old leather bound book dating back to early 19th century ensures outer protection. This book has been made in two copies i.e. two unique books, one with slightly more prints and without cassette.